I really don’t understand why Apple has this cult following. Do all Apple products ship with a subliminal message that I’m immume to? I don’t want to piss off the Apple fanatics, but what is it that draws you to their products. I’d love to hear from you all. 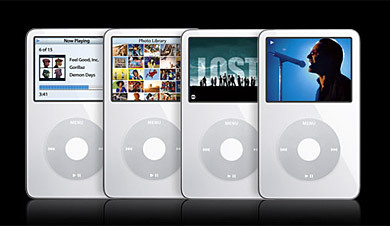 This week everyone is talking about the iPod and how it supports video. That’s not shocking at all… portable Windows Media Centers have been out for two years now and to be honest, there isn’t a compelling reason to own one. Maybe a Sony PSP, since it is more of an entertainment device with a big screen so I can play both games and watch videos, but not an MP3 player trying to be a video player. Doesn’t make sense to me and if it does become successful, well, I think the writers of Lost should write that into their weirdass storyline (which I love BTW!). I really think that MP3 players will be a thing of the past and integrated into cellphones — they already are! This is the most practical and most realistic convergence, you use a phone to talk and listen. The amazing thing about the whole iPod video announcement was the fact that Disney gave them rights to use Lost and Desperate Housewives — that was the shock and awe for me! I think the main reason why I don’t really care for the iPod video is that it’s not really a video player… it’s still mainly an audio iPod, with limited video capabilities. At least they are FINALLY getting into the game, which is going to give some great competition to MSFT and TiVo — Ding. Ding. Ding. Apple Offering Films on iTunes — Not Impressed.